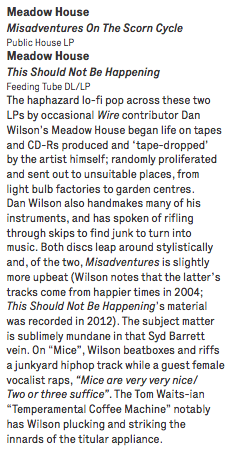 I first heard of Dan Wilson (the fellow behind Meadow House, Radionics Radio and a quarter of post-electronics quartet Oscillatorial Binnage) back in 2005 when a friend turned me on to his brilliant radio programs on London’s Resonance 104.4 FM. These shows chronicle the misadventures of a hermetic renaissance man who leaves cassettes full of his home recorded “songs” scattered around the city like litter (a practice known as “tape dropping”). You might find such a tape wrapped in a suicide note, or on a toilet seat in a public restroom or the floor of a subway train. Wilson’s compositions from this period, which were performed on homemade instruments, were usually angst-ridden affairs, extremely bleak. 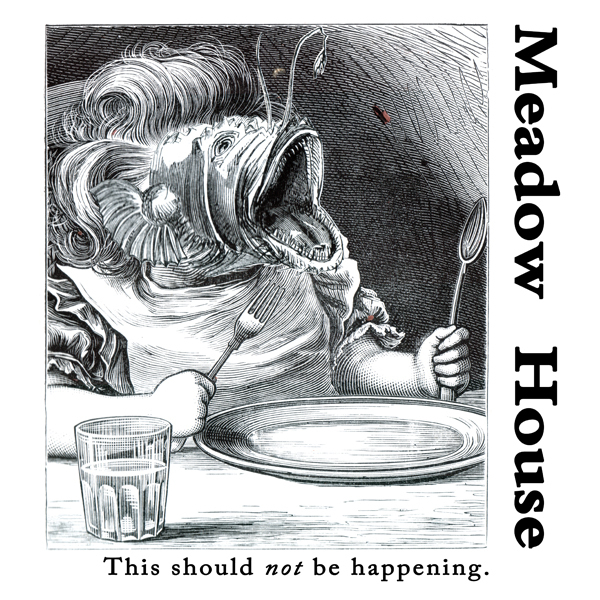 When I was asked to assemble a record from 60-plus unreleased Meadow House songs, I was struggling with my own depression. So naturally I gravitated towards his darker songs, of which there were plenty. Sometimes they’re filled with an almost manic exuberance, but the faint of heart should exercise caution…there is no happy ending.